It sure has been a challenge over the years, trying to explain to far to many Aussie householders, that installing the biggest solar system on their roof, is NOT necessarily the secret to making the most money, from solar power! After talking to a couple of ELECTRICITY METER & BILL ANALYSIS clients this week, whom had no idea what Net metering was, we thought we would air some basic maths. So for the remaining non-believer's and those whom simply have no idea, where often there is a belief BIGGER makes more money, here is the maths. The data table shows you simply what you can expect to make, when using all or nothing of the excess solar power. The actual return will depend on how much of that excess solar power you can STOP returning to the grid, by using it. Now that is quite a saving! What are you waiting for? Start getting more from your solar power investment! 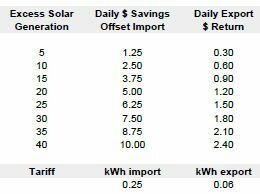 See the maths on our SOLAR NET FIT METERING AND BILLING page.